It’s rare that I get to take some local pride and puff my chest about a movie being shot in Ohio. Take Shelter, a small, suspenseful character-piece, was filmed in Loraine County, near Cleveland. Several of the actors in the production are local actors, including Tova Stewart, the adorable seven-year-old who plays the onscreen deaf daughter. The young gal, who is also deaf in real-life, is from Columbus and was in attendance at the theater I saw Take Shelter at. And I can beam with even more local pride at the fact that Take Shelter is unwaveringly magnificent. It’s a remarkably tense movie, deeply realized, expertly crafted, and one of the best films of the year. Curtis (Michael Shannon) is a working-class family man in rural Ohio. He works as a manager of a two-man drill team, scouring the earth for valuable deposits. His wife, Samantha (Jessica Chastain), cares for their recently deaf daughter, Hannah (Stewart), and sews pillows and embroidery on the side. They are making ends meet to save up for Hannah’s cochlear implant surgery. This family tranquility is interrupted when Curtis begins having strange visions. He sees dark, ominous storms that no one else seems to see. He hears loud cracks of thunder during clear skies. He feels the dark rain fall on his person. He wakes from frightful dreams detailing friends and family turning on him. What does it all mean? Curtis feels compelled to remodel the storm shelter in the backyard. He even purchases a cargo container and buries it in the yard, collecting some end-of-the-world provisions. Could Curtis just be crazy? His mother has been in a psychiatric home since she abandoned Curtis as a child. She began having schizophrenic episodes in her mid 30s, and Curtis is now 35. Is he being warned of what lies ahead or is he succumbing to the pull of a hereditary mental illness? This is very likely the most nerve-racking, tense, dread-filled film I’ve watched since 2009’s Oscar-winner, The Hurt Locker. Writer/director Jeff Nichols (Shotgun Stories) masterfully lays out the particulars of his tale. Even the family drama has some nicely constructed tension. Curtis’ family is living paycheck to paycheck, so his backyard project is a real financial setback. By borrowing equipment from his work, Curtis is even risking losing his job, the only way he can afford his child’s cochlear implant. Not only do we dread stormy weather and strange flocking patterns for birds, we dread the everyday struggles of keeping afloat. Curtis following his visions can very likely put his family into financial ruin, but is that a risk worth taking? Nichols nicely creates an authentic small-town setting. There are small, acute character touches that enrich the story, like when Dewart (Shea Wigham) concludes that the best compliment a man can give is that “he’s lived a good life.” When Curtis and Samantha watch their daughter sleep, they share behavior they are still trying to kick in adjusting to having a deaf child (“I still take my boots off not to wake her,” he confides. “I still whisper,” she returns). These people and their troubles feel believable, and their reactions to Curtis’ strange behavior feel extremely believable. Whispers begin to spread and people start to treat madness like it’s a communicable illness. Religion seems like a natural landing zone when discussing anything apocalyptic and/or prophetic, but Nichols sidesteps this discussion. There could have been some interesting theological room to explore here, considering a Biblical prophet would likely be derided as mentally ill in our modern age. Nichols keeps things secular. Curtis is admonished for missing church again, but that’s about the extent of religion in the man’s life. He does not seek out spiritual advice. He seeks out psychiatry, at least if he could afford it he would. There are some terrific standard thriller moments, like some well-calculated jump scares and many nightmare fake-outs, but the film’s real skill is drawing out tension to the point where you want to shout at the screen. This is a deliberately paced thriller knotted with unbearable tension. We become conditioned to start doubting the onscreen imagery after Curtis’ series of nightmares. Every time there’s a storm now the audience, too, fears the validity of what we witness. What is the significance of these portent signs? There’s a moment toward the climax, where a storm door needs to be opened, and I simultaneously was dreading every second leading up to that door opening and silently screaming in anticipation. Every part of me wanted to see what was going to happen next and I could not guess where Nichols would take us. I was a nervous wreck. The dread was so heavy, so all consuming, and not just from an apocalyptic standpoint. Curtis understandingly thinks he may be nuts, especially since his own mother is a paranoid schizophrenic. The threat isn’t just the strange apocalyptic signs but also Curtis himself unraveling and lashing out. He worries that he’ll become a danger to his own family, and if he cannot discern the difference between reality and fantasy it’s only a matter of time before he jeopardizes his loved ones. He fears he’ll be ripped away from his family. He wants to be better, he wants to be “normal,” but he can’t trust his own senses. Take Shelter is also so effective thanks to Shannon, a talented actor who always seems to be on the brink of freaking out. The bug-eyed, crazed, monotone actor has played plenty of nutcases in the movies. He was nominated for an Oscar in 2009 for Revolutionary Road for playing such a nutter. He’s a live wire of an actor, simmering, waiting for the final cue to explode. Shannon uses this intensity to his great advantage, wonderfully mirroring the movie’s compounding dread. Shannon’s character is troubled, that’s for sure, and worries about slipping into insanity. His performance is simply riveting, searching for answers amidst the desire to keep his family safe at all costs, even if that eventually means his removal. When he has to confront his central dilemma, the legitimacy of his visions, Shannon is racked with fear, eyes glistening with tears, terrified to go on faith, and your eyes are glued to the screen, completely taken in by the depth of the performance. I hope Shannon gets some due recognition come awards season because I doubt I’ll see few performances more compelling. Chastain has had quite a breakout year for herself with lead roles in Tree of Life, The Help, and The Debt. She has a remarkable vulnerability to her, radiating an ethereal vibe (no doubt why Terrence Mallick chose her), and both aspects are put to fine use in Take Shelter. She’s much more than the oft underwritten put-upon wife, silently enduring her husband’s foibles. She’s desperate for an answer to explain her husband’s actions and motivations. She’s alert, angry, compassionate, and deeply concerned. Chastain holds her own with Shannon, and the two elevate each other’s performance subtlety, making their supportive relationship even more believable. 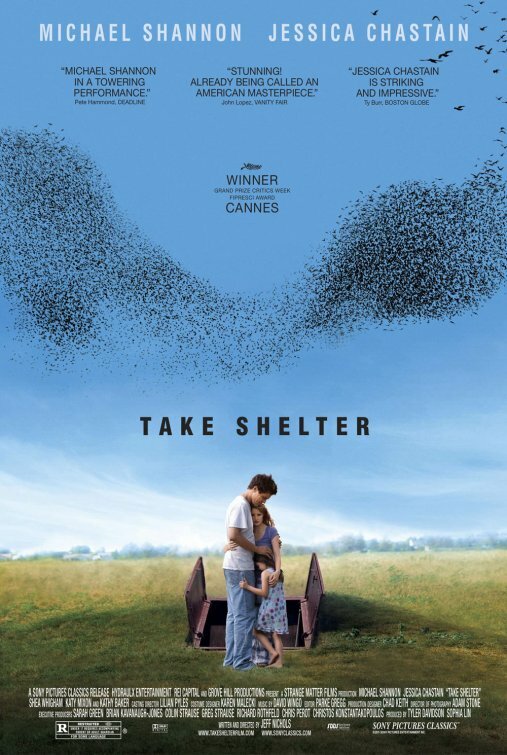 Take heed movie lovers, and make sure to find Take Shelter, an intelligent, expertly constructed, suspenseful drama with powerful performances and a powerful sense of dread. Shannon’s coiled intensity nicely fits the mounting tension. Nichols has created a taut thriller, a fiercely felt human drama, and an involving character-piece attuned to the talents of its cast. Take Shelter is a commanding, unsettling film that puts the audience in the unreliable position of the main character’s point of view. You may almost hope for some actual apocalypse just to validate the guy’s struggle. When was the last time you secretly hoped for the end of the world just to give one person a sense of relief? Take shelter from inferior movies and find a theater playing this tremendous movie. Posted on November 6, 2011, in 2011 Movies and tagged drama, horror, indie, jeff nichols, jessica chastain, mental illness, michael shannon, oscar, small-town. Bookmark the permalink. Leave a comment.